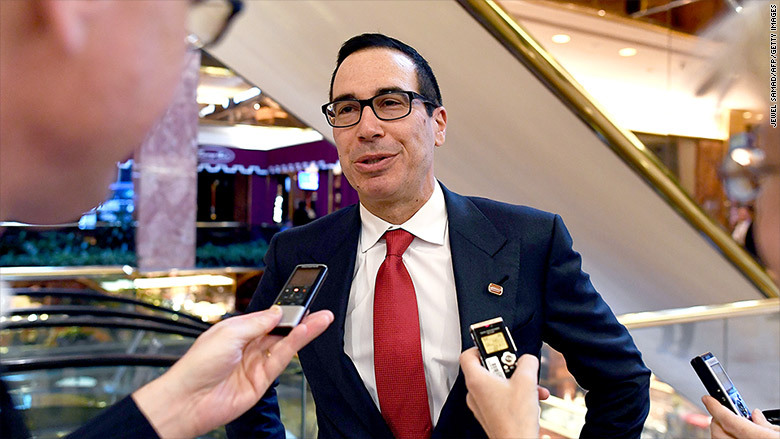 Financier and Hollywood producer Steven Mnuchin has been named Secretary of the Treasury, which is one of the most powerful and important positions in the federal government. But plenty of people don't really know what he -- and so far it's only been he -- does. Very broadly, the Treasury secretary is the government's banker, responsible for paying trillions of dollars in bills. To do so he collects taxes, and sells bonds to investors. It's an important enough job to get Treasury secretaries on our currency, and one of them onto Broadway. Alexander Hamilton was the nation's first treasury chief, helping to unify the 13 colonies by deciding to pay off all of their Revolutionary War debts together. His role was so critical to the country's formation that his face is on the $10 bill, and he went on to headline a hit Broadway show. 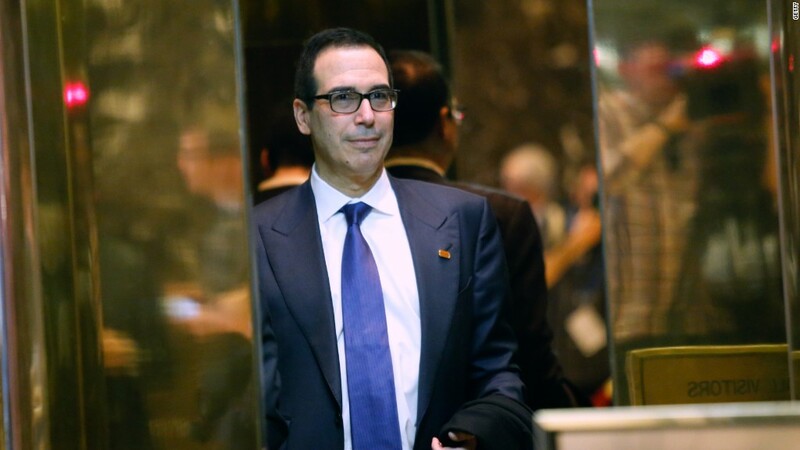 Wall Street insider and Hollywood producer Steve Mnuchin has been named Trump's Treasury Secretary. Debt: Managing the federal debt is still central to the Treasury secretary's job more than two centuries after Hamilton. Today, the Treasury secretary is the administration's point person when there's a battle on Capitol Hill about whether to raise the nation's debt ceiling and keep the government up and running. And it's the Treasury secretary who must deal with the fallout when the U.S. credit rating is downgraded. Taxes: Treasury oversees the IRS. In fact, the department has about 100,000 employees, and about 91,000 of them are with the IRS. Terrorism: The Treasury secretary plays a key role in the war on terror, establishing and enforcing bank regulations designed to combat the money laundering that finances terrorism organizations. For instance, many of the sanctions that the United States imposed on members of the Russian government and its business elite were imposed by the Treasury department. Wall Street: Treasury is a key regulator of banking, Wall Street and the rest of the financial sector. The secretary is a chief negotiator with finance ministers around the globe, a role that's particularly critical during times of financial crisis. Henry Paulson, the Treasury secretary under President George W. Bush, was credited with helping to prevent the global economy from sliding into another Great Depression during the 2008 financial crisis, winning approval from Congress for the unpopular bailouts of banks and mortgage lenders. Currency: Treasury oversees the U.S. Mint and the Bureau of Engraving and Printing, and the secretary's signature appears on U.S. paper money. President Obama's Treasury Secretary Jack Lew achieved some degree of fame when he made the hotly-contested decision to keep Hamilton on the $10 bill and put Harriet Tubman on the front of the $20 bill. And possibly, Leader of the Free World: The treasury secretary is fifth in the line of succession to the presidency, behind only the Vice President, leaders of House and Senate and the Secretary of State. He stands ahead of the Defense Secretary and the Attorney General.